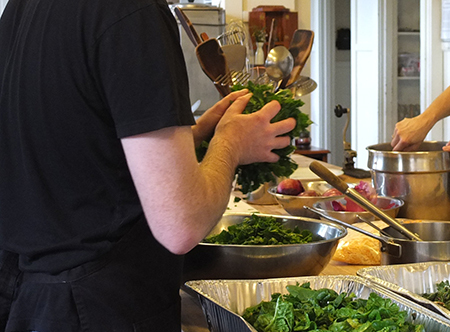 San Francisco Zen Center, in cooperation with the San Francisco Interfaith Council and the Gubbio Project, offers meals (breakfast and dinner) on a semi-regular basis to homeless men and women. We are compiling a list of volunteers who are interested in being invited to help with these meals. If you would like to be included, please send an email to Outreach Coordinator Jeffrey Schneider at outreach@sfzc.org. Please note that being on the list does not commit you to anything other than receiving information. You are at liberty to pick up as many (or as few) meal preparation shifts as you are able and willing to do. There is no minimum requirement.